More of us than ever before are renting homes rather than buying them, and that means we’re restricted when it comes to the modifications we can make. If you’re part of this growing demographic, then you might be forbidden from doing things like drilling into walls. This can make everyday tasks like putting up curtains a little bit complicated. But fear not! It’s perfectly possible to hang curtains without a drilling into rental walls. In this short guide, we’ll talk you through a few different methods of doing exactly that. 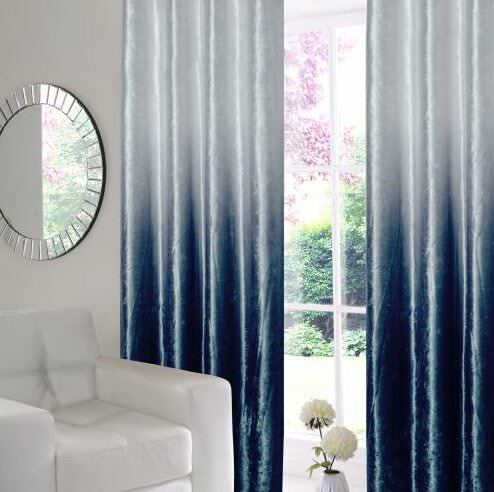 Ombre Velvet Pencil Pleat Curtains. Get them here. You might have already encountered sticky hooks that are used to hang keys, clothes and pictures. These are relatively inexpensive, and you don’t need any special expertise or complex tools to use them. To hang curtains, you’ll need to choose the largest hooks available. Determine how far from the edge of your window your hooks need to be by measuring the total length of your window, and subtracting it from the length of your rail (accounting for any embellishments on the end of the rail). Then, divide the figure by two. Take a piece of cardboard and cut a right-angle from the bottom corner. Then, cut the opposite side so that the distance between the angle and the edge of the cardboard matches the figure you’ve just arrived at. Place the cardboard into position on the corner of the window, and place a hook against it. Mark two points with a pencil – one on the bottom of the hook, and one on the top. Punch holes through both points so that you can mark the wall beneath with a pencil. Flip the cardboard over and do exactly the same on the other side. This will create a mirror image of the first template, so the two sets of markings will align horizontally. Stick your hooks into place. Push both firmly against the surface for around a minute to ensure maximum adhesion, and leave them in place for around an hour before placing weight on them. Once you’re done, you’ll have two parallel hooks that’ll support the rail, and any curtains you choose to hang from it. This method is popular for a reason. Given that the point of contact between the rail and the wall is very small, you’ll be able to remove the hooks when you leave without causing lasting damage. If you’d like to customise the look further, you could spray-paint the hooks prior to installation. Velcro make their famous hook-and-zip temporary adhesive in strip form. This will allow you to take a few patches of the Velcro and attach them to the wall at various points across the top of your window. If the surface is smooth enough, the strips should be able to hold up hedge-trimmers and sledgehammers, so you shouldn’t have any problems getting blinds to stay in place. It’ll be easier to get the tape to stick if you stick it to the top of the frame, especially if the frame is made of metal. Certain types of curtain and blind will need to be attached to rods rather than rails, but you can still attach Velcro to these with the help of Velcro-equipped cable-tidies. These are inexpensive, which means you can attach as many as you like across the length of the rail. As such, this is a really easy way to hang curtains without nails. If you’re going to apply adhesive to your wall, you run the risk of having the paint peel off when you come to remove it. This might pose a minor problem when you move out – but not as large a problem as repairing the holes you’ve drilled in the wall. Glue-based solutions like adhesive hooks and Velcro tape will be affected by moisture and heat, which makes them a poor choice in rooms like kitchens and bathrooms. Tension rods don’t need to be stuck to the wall – the pressure they exert on the sides of the window recess will hold it in place, even after a curtain has been hung. These are perfect for windows in an alcove or similar. You’ll be able to slot them at the top of the frame recess, for total coverage, or move them down for a specific effect. Making small adjustments is incredibly straightforward. This approach does have its limitations, however. For one thing, you’ll be unable to hang a curtain that’s wider than the size of the window recess. For another, tension rods might not be able to support heavier window dressings. Renters have several options when it comes to hanging curtains without drilling or nailing. Some of them require adhesive, while others rely on tension. When making your decision, you’ll need to think about the weight that the rail will have to bear, and the stress you’ll be placing on the rail when you open and close the blind or curtain. Need new blinds? You can view our full range of blinds here. Alternatively view our roller blinds, or our roman blinds.